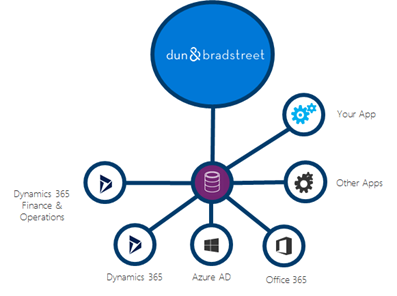 D&B Optimizer leverages the simplicity of the Microsoft platform by enabling customer data to be sourced from multiple data sources and apps and integrated into the Common Data Service in a standardized format. Once in the Common Data Service a Flow Template is available to match your data immediately against the connector for Dun & Bradstreet. The Common Data Service will allow customers to avoid bespoke integrations to Dun & Bradstreet from different systems, users will be able to bring in their data using one of the existing data integration projects, Power Query (Preview) or simply import the data. After matching through Flow and the Dun & Bradstreet connector, the following Business Profile is created in the Common Data Service. Organization Name Gorman Manufacturing Company, Inc. Global Ultimate Organization Name Gorman Manufacturing Company, Inc. Domestic Ultimate Organization Name Gorman Manufacturing Company, Inc.
To ensure this integration is as smooth as possible, Microsoft has collaborated with Dun & Bradstreet to introduce the new Business Profile entity to be part of the Common Data Service to reduce the need for custom objects, and to allow customers and ISVs to build solutions leveraging this data as well. The enriched Business Profile not only includes the business and contact information for an organization, but also the information to support data cleansing and improvement, territory management and organizational structure. With access to this business intelligence, organizations will gain a single source of data truth to increase alignment across your organization and improve productivity with a more complete view of your customers and prospects. The D&B Optimizer solution also includes PowerBI reports to segment your customer data, and quickly identify data quality issues. Customers who are using Dynamics 365 will benefit from a D&B Optimizer solution available for Dynamics 365 for Sales which brings the Business Profile information directly back into the Account form. We are extremely excited to announce the release of the D&B Optimizer solution, not only for the immediate benefit we can see this bring users but also as a great example of one of our strategic ISVs leveraging the Common Data Service, Microsoft Flow and PowerBI to develop an awesome solution for our joint customers. D&B Optimizer requires users to have access to a Common Data Service environment and an active subscription for Dun & Bradstreet services. Find more information here, and how to get started here. You can read the announcement of the strategic partnership announced in July, 2017 here.